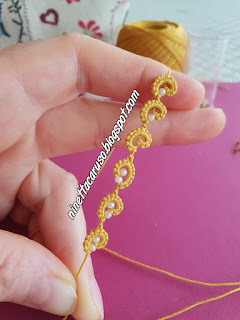 How to tat the spiral rings by Lenka Hašková, showed in previous post. I asked her permission to write a tutorial in my blog and she kindly agreed. She also agreed to call it "the spiral ring", but I'm sorry, forgive me if I call it Lenka's ring! You can find her blog here: frivolenka.blogspot.com, please, take a minute to visit her and say a thank you! Only one shuttle is needed. Lenka's "spiral ring" is a normal ring, with at least one picot, twisted and blocked in position through one of its picots. After closing the ring, the thread is passed to the back side and pulled upwards, toward the picot. Then block the spiral in position with a lock join. 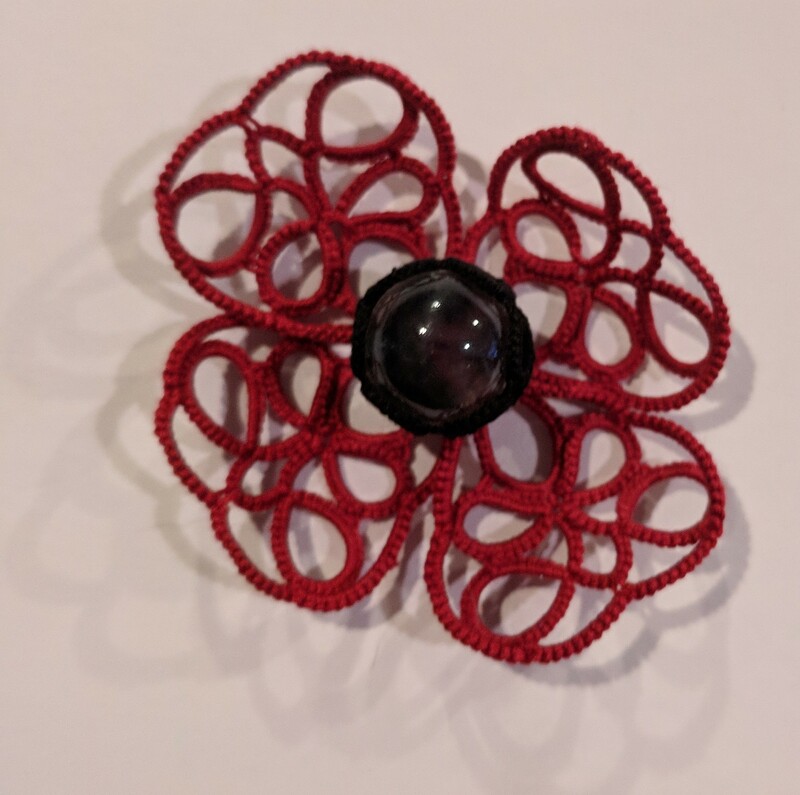 The picot used to block the spiral in position, may vary in size. That determines the distance between spirals. 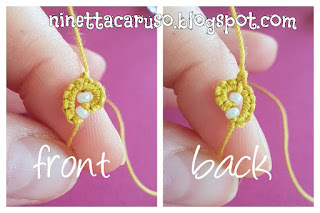 If you want a lanyard of spiral rings very close to each other, the picot used to block the spiral must be very small. Any ring can be twisted in this way, as long as there is a picot in it, in any position on the outer spiral; the twist is made only after the ring is closed. As a design element, it is like a single shuttle split ring, where the starting point and the ending point are not at the same point. 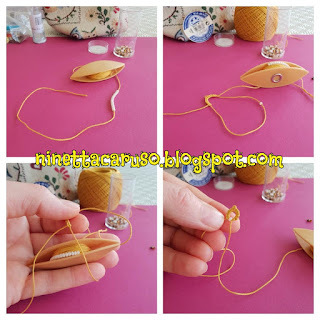 It has a front and a back side, because it is just like the nineteenth-century method of tatting a lanyard of rings with bare thread in the middle, in order to climb to the next ring in the line. 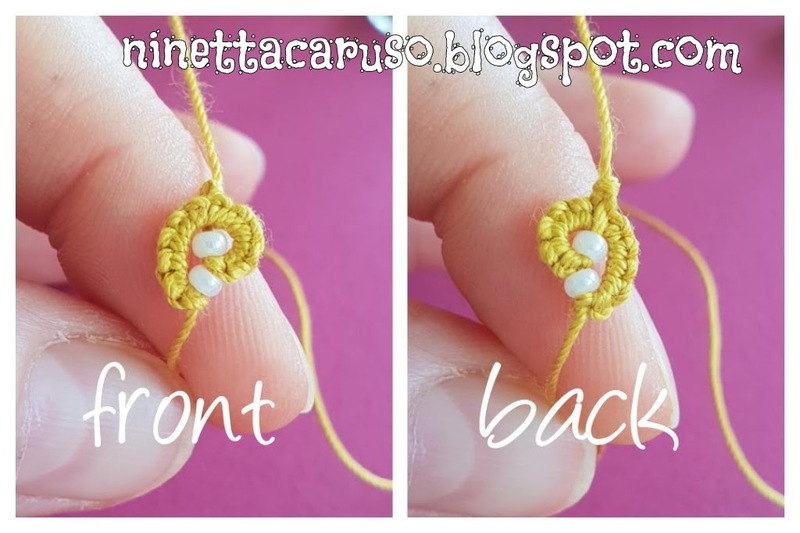 Beads can be added inside the loop for the ring, too. A bead (or more) can be trapped at the base of the ring to emphasise the twist. 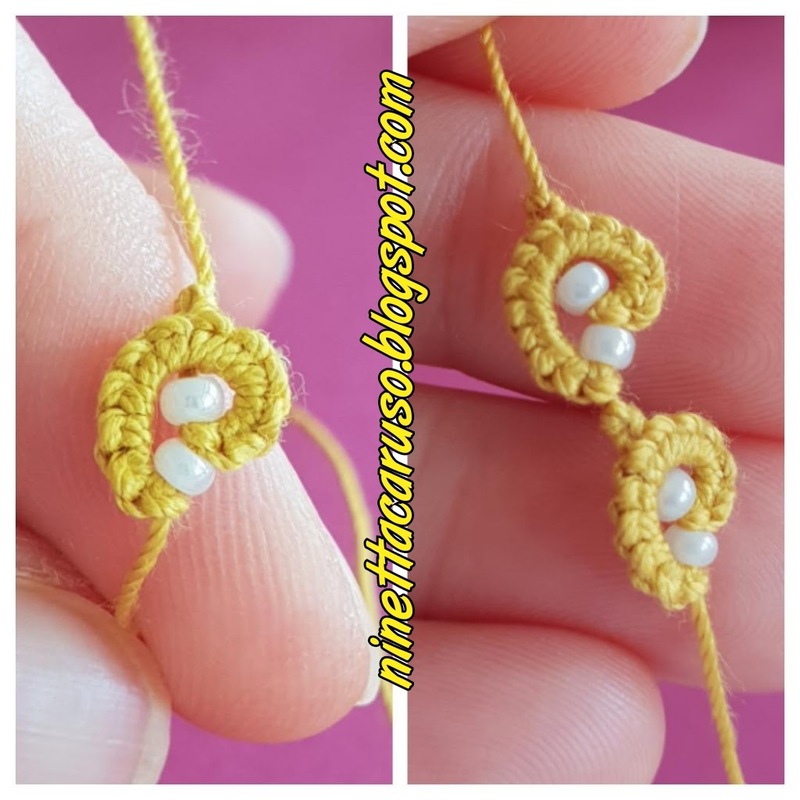 Just after that the ring has been closed and before the lock join, bead/beads can be added in the bare thread between the base of the ring and the join, to put an accent in the centre of the spiral ring. 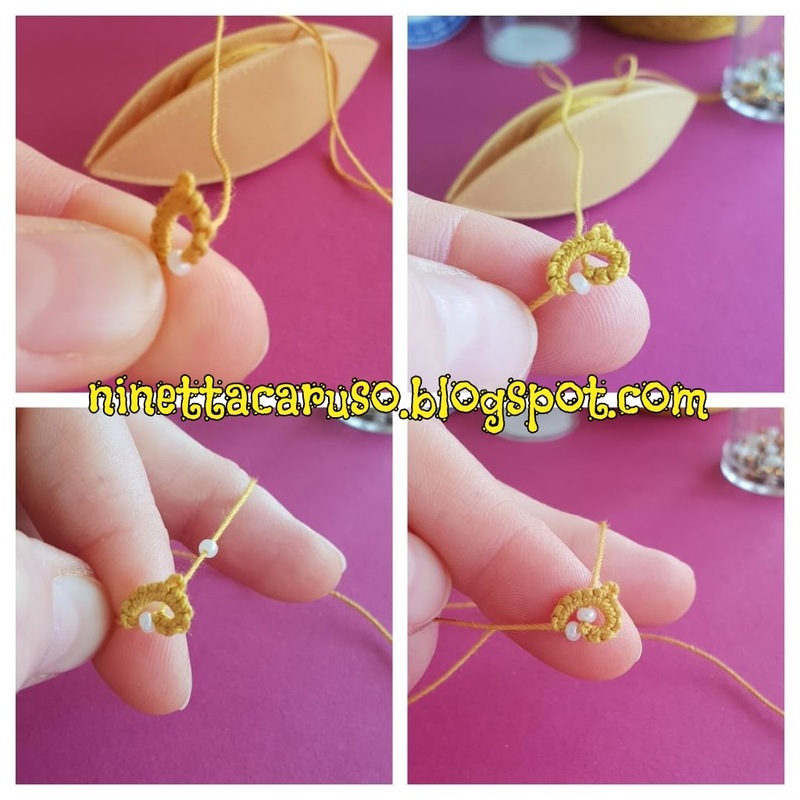 So, there I got a normal ring, with a picot in the centre and a bead trapped at the base. In next collage the spiral is appearing: I put the thread behind the ring, that's the back side from now on, then pull it (in the meantime you hold firmly the thread at the base of the ring) and slide a bead in the bare thread between the base of the ring and the picot, then lock join to the picot. In the next collage you can see, on the left, the spiral ring completed, the front of the spiral is clockwise. On the right, there is also a second spiral, started over the first, just after the lock join, this time I tatted a ring of 8ds, then a picot, then 6 ds, then, before closing, again I inserted the shuttle inside the loop. On the right of previous picture, you see that I didn't put beads in the last spiral ring, the twist is clear indeed. That is a delightful and interesting method and I think it can be a nice effect to learn and use in patterns. I hope that you like it and wish to play with it. Many many thanks to Lenka! In my next post, I will show you how I tatted the spiral rings with treble tatting stitches in place of traditional double stitches. Yes, that’s a wonderful effect, thanks for exploring vans explaining it. I’m going to visit Lenka ‘s blog, thanks for the link. This is very interesting. I've just saved it to my techniques file and will have to play with it. I get the feeling that this is more like a half closed ring (but with very little bare thread) than a SSSR? Or that the spiral will be more pronounced and neat if we do not close the ring too tightly as we would do in case of normal/split rings ? 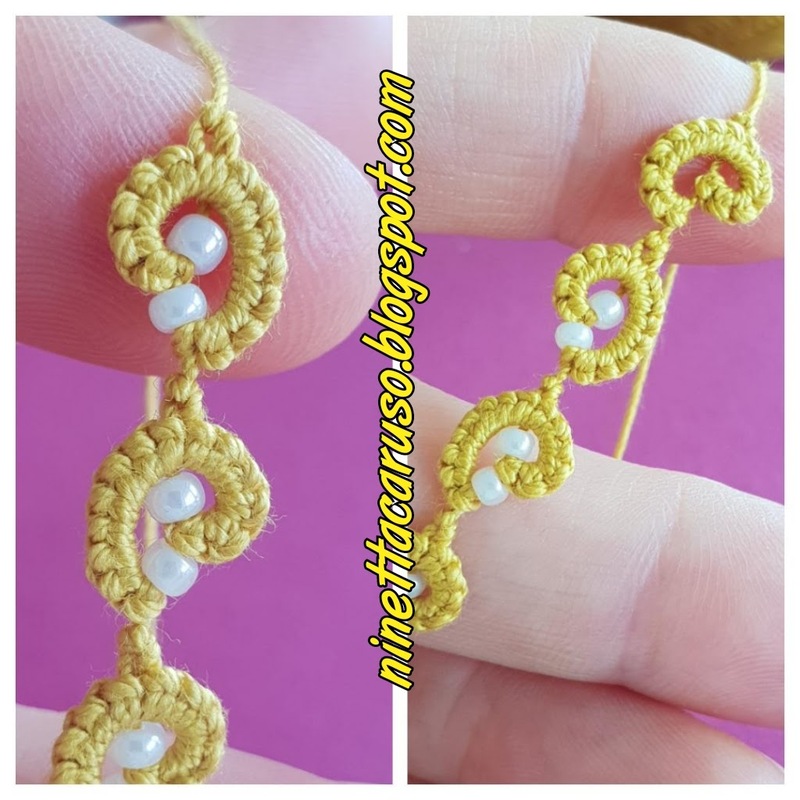 I really like this new design and thank you for doing an explanation on how to do the stitch. Something I must try so I have put it on my to do list. I am glad I made your day, the pictures just don’t do the display justice, We found three of mine and I am glad you found one of yours in the picture. Even Cathy who organised it all and did it all made three squares and she can’t find hers. I’m sorry it’s took nearly a week to blog it but I was totally knackered when I got back and had to have a total rest for a few days. If you get a chance to see it, do go it’s a wonderful display of tatting. Dear Ninetta, thank you very much for sharing a spiral ring. I'm so glad that it is liked. Thank you all and I will be happy for using this feature. I look forward to practical use. :-h :X thanks to you! 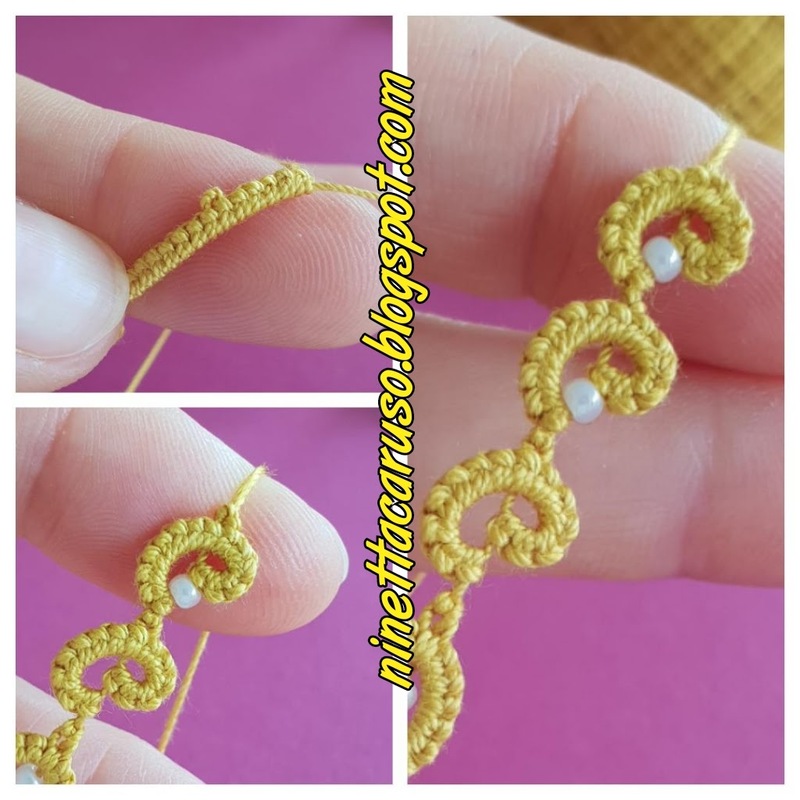 Thanks to you and Lenka for posting the directions for a spiral ring! Very pretty effect.